Bayern Munich attacker James Rodriguez will have an extra shot of adrenaline coursing through his veins when his side meet Real Madrid in their UEFA Champions League semi-final first leg on Tuesday, as the Colombian has a point to prove against his parent club following a disappointing spell in the Spanish capital. Click here for team, LIVE build-up and coverage of the second leg! The reigning European champions recruited James in the wake of the 2014 FIFA World Cup, where he dazzled for Los Cafeteros, finishing the tournament as top scorer after a series of performances that confirmed his status as a player of rare quality. Now on loan at Bayern, the former FC Porto and Monaco magician is thriving, and thrilling, once again. Indeed, such have been James's on-field fireworks this term, his Spanish employers will be fretting at the prospect facing Säbener Straße's South American sorcerer. 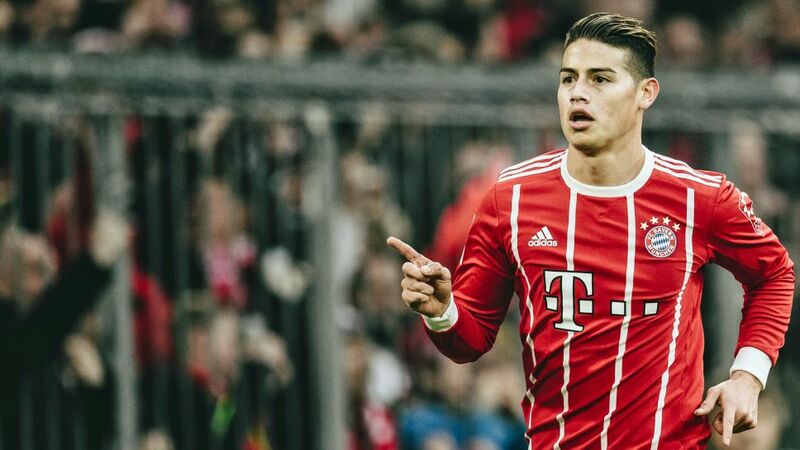 Trusted by Bayern coach Jupp Heynckes, who has worked hard developing James 2.0, the oft deep-lying midfielder, Bayern's No.11 has been devastating, contributing six goals and 12 assists in 34 games across all competitions in his maiden campaign in Germany. He has also started 17 of his 21 Bundesliga outings to date, including those momentous meetings with Borussia Dortmund, Schalke and RB Leipzig. On top of that, James has played in every UEFA Champions League game this season, starting six of Bayern's ten European assignments. It all means that everything is set up superbly for Wednesday and Bayern's opening game against the their European nemesis. Hoping to pull the strings against his former colleagues, it would come as no surprise if the Colombian schemer helped to orchestrate a first-leg lead for the Bavarians to take back to Madrid for the return fixture on May 1st. It was there, during James's first season in Spain, that the Cucuta native posted some solid numbers to please the notoriously demanding Santiago Barnabeu faithful, the player registering 17 goals and 18 assists in 46 outings in all competitions. Playing under Carlo Ancelotti – the man who would eventually woo him to Bayern in July 2017 – he started 29 times and only six outfield players enjoyed more minutes on the pitch throughout the entire campaign. At that point it appeared the only way was up for James. Except it wasn't. Ancelotti was replaced by Rafa Benitez in summer 2015 and James was on the bench in the new coach's first game in charge. He then missed nearly two months with a muscle tear and just as he was working his way back into the side, Benitez was dismissed and Zinedine Zidane took over. Yet the mouth-watering prospect of Zidane, himself a sublime playmaker in his heyday, teasing out the best from James never materialised. Gradually, James slipped down the pecking order in midfield, his game time decreasing. In 2015/16 played just 1858 minutes in all competitions – 14th among all Real Madrid squad members – but still managed eight goals and 10 assists. The following year, his last in Madrid, it was even less at 1824 minutes, putting him 17th. To make matters worse, whenever James did play it was often out of position. In 2015/16, only one of his 17 La Liga starts was in central attacking midfield, while last term just three of his 13 appearances in the first XI were in his preferred role. "I hope to play where I feel most comfortable and help the team to win,” he once said. “I feel more comfortable where I play for Colombia because I like to be closer to the goal; that works better for me. I can score and pass from there but, as a player, I have to be prepared to play in any position." Despite his willingness to be flexible, James was not trusted to play in the big games. He was an unused substitute in the first Clásico of the 2016/17 campaign against Barcelona and only played eight minutes at the end of the reverse fixture. In the Champions League, he was given just seven minutes across the quarter-finals against Bayern, did not make it off the bench at all in the semi-finals and was omitted from the squad altogether for last year's final against Juventus. It was clear, then, that the writing was very much on the Bernabeu wall. At 26 and entering his prime in a World Cup year, the prospect of warming the bench again was not an appealing one. Against that backdrop, it is understandable that James would be keen to prove Zidane and Real Madrid wrong over the two legs of this year's semi-final. Last November, Cristiano Ronaldo himself took the unusual step of indicating that the club had made a mistake in letting James go: "The players who have arrived have a lot of potential but Pepe, Morata, James, made us stronger." And it is just that strength that Ronaldo and Co. will be extra wary of when Real Madrid enter the dangerous realm of James Rodriguez's current hunting ground on Wednesday. Click here to follow LIVE build-up to Bayern vs. Real!